If there is a landscape that one can savor in Extremadura that is the Dehesa. From Trujillo to Caceres, and then to Merida, you can see oaks everywhere, resulting in the most characteristic landscape of the region. 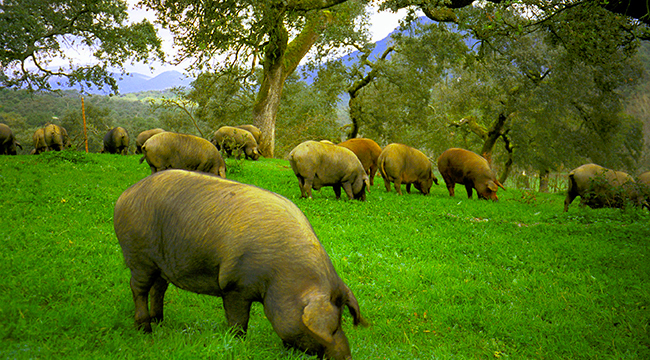 Here, among the acorns and fruits of the green meadows, you can find the king of Extremadura and the basic ingredient of all Spanish gastronomy: the authentic Iberian pig! The best hams in the world are produced in this beautiful landscape. But the pig is not the only inhabitant, since the huge oaks, chestnut trees and olive trees are also home to the appreciated retintas cows. Plus, this is a deer hunting paradise that gives even more prestige to Extremadura meats and sausages. In addition, more than 340 species of birds make this region’s sky one of the most varied and rich in Spain. You shouldn’t forget that Extremadura is the land of one of the most famous explorers, Trujillo de Pizarro. 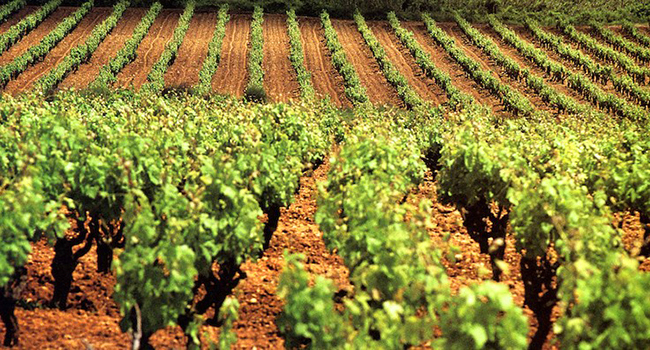 At the foot of his imposing castle, the vineyards are integrated into the landscape in one of the only two areas of the province of Caceres belonging to this designation of origin. Extremadura is rising as a wine region and wine cellars have quickly conquered the international market. However, there is a winery that has especially contributed to this outstanding reputation, Haba. Among the small hills that draw tiny valleys, over 20 grape varieties are grown: Alarije, Viura, Chardonnay, Verdejo or Pedro Ximenez are the best white wines and Garnacha, Tempranillo, Cabernet Sauvignon, Graciano, Mazuela, Merlot and Syrah are the best examples of good red wine. This is one of those privileged places that happens to be in Extremadura. 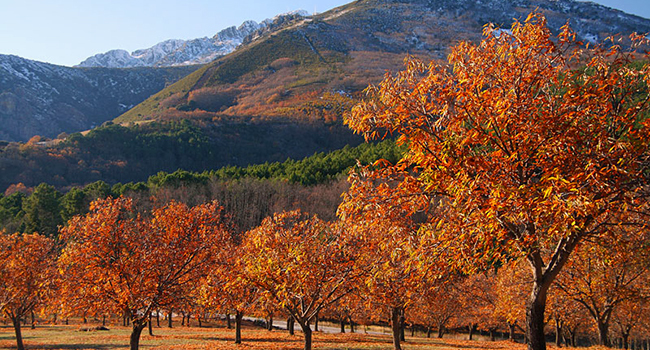 In the shadow of the snowy peaks of La Covacha and Almazor in Sierra de Gredos, and in the cool river Tietar area, there is a unique microclimate in Spain which is perfect for the cultivation of subtropical fruits. 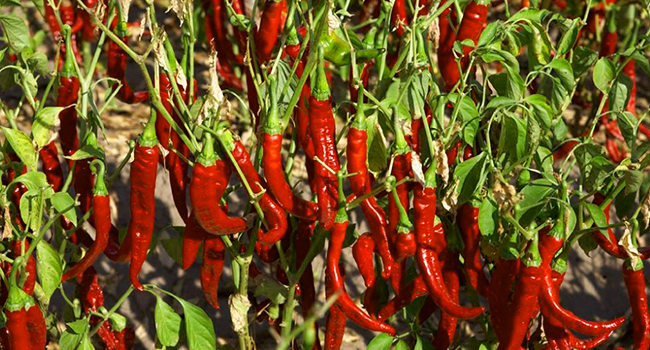 Yes, La Vera is the world capital of paprika, and the pepper fields dot the landscape and fill it with color. However, this is also a land of tobacco plantations, small towns, pristine waters, narrow streets, cherry blossoms, rugged gorges, rich gardens, poplars and fruit trees. Its nature is home to eagles, blackbirds, mountain goats, otters, and, if you look up at the sky, you can see the flight of vultures nearby National Park Monfragüe. Meanwhile, in the neighboring valley of the river Jerte, at the end of the Sierra de Gredos , thousands of people are waiting to see the awakening of spring in the form of white flowers when the snows of the peaks are beginning to disappear. The panorama during the last week of March and the first week of April is almost certainly the most photographed one. Don’t miss one of the most colorful festivals of all Extremadura . Known as Xerete, “pristine stream” for the Arabs, and “valley of pleasure” for the Romans, this is a place scented with thyme and orchids, where long ago the nomadic peoples of the North rested, and where nature lives out without pause but without haste. 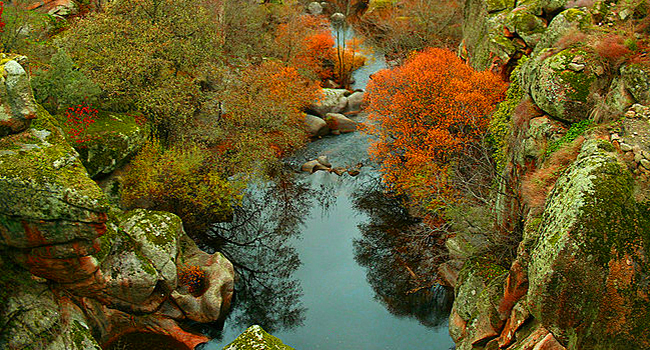 Los Ibores is the most Eastern part of Extremadura and, although it is almost part of La Mancha, its landscape of mountains and streams is reminiscent of lands further north. Here, the Mediterranean forest merges with chestnuts and oaks, the rocks are covered in moss thanks to the fresh water that comes from streams, and on top of the slopes , you will be able to see thousand of mountain goats almost suspended in the air. They are responsible for the region’s famous and tasty cheeses. 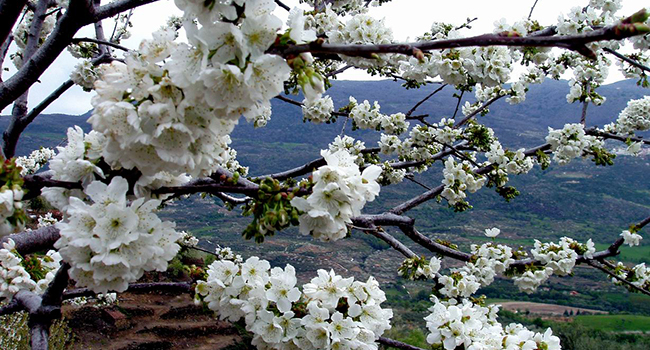 The waters of the Tagus, Gualija and Viejas rivers make the landscape a beautiful greenery and, in spring, the area is covered with a colorful and aromatic blanket of flowers that bees use in order to create tasteful and fragrant honey. As impressive as visiting the unmissable Cueva del Helechal! The first inhabitants of the Iberian Peninsula must have been fascinated with the natural wealth of the area situated between the Tagus and Guadiana rivers, since this is the area with the largest number of cave paintings in Extremadura. And it is no wonder considering that this is also the area with the greatest scenic variety: oaks, alder trees, holms, and ash trees that make the fall the most beautiful time of the year thanks to its impressive colors. Amid nature and tranquility, the Iberian lynx still lives here. One of the most typical dishes in the region is the slightly spicy Guadalupe black pudding. Guadalupe is the most important village and its monastery is totally worth a visit. If you are visiting Extremadura, you shouldn’t miss the most inhospitable areas called senderos del agua, marked by the Cijara, Garcia Sola, Zujar, La Serena and Orellana reservoirs and form the largest expanse of fresh water in Spain. 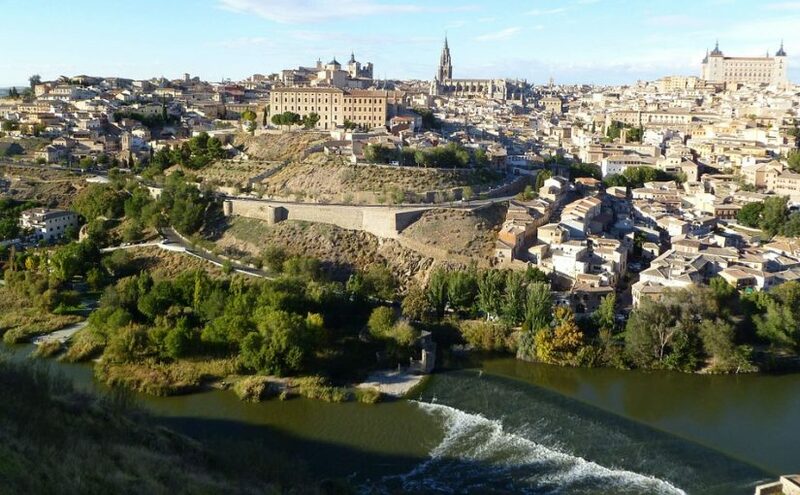 After that, visit the northwest of the province of Badajoz , about 400 meters above sea level. 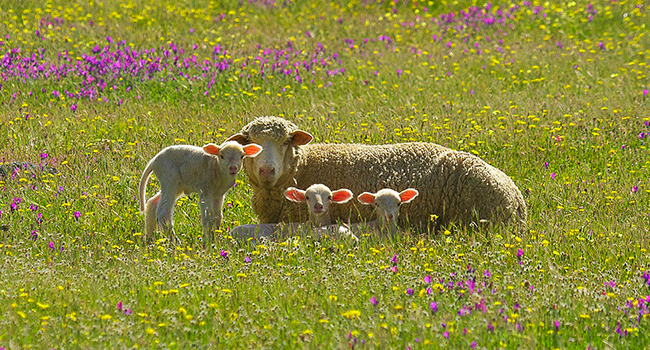 The landscape is dominated by plains of scrubland with rockrose, rosemary and pastures where the merino sheep roam at ease to produce the famous cheese Torta de la Serena. How can you tell it apart from the also very famous Torta del Casar? To begin with, the milk doesn’t mix different sheep breeds and it is a little less dense inside, because there is less rain in La Serena and it is way hotter. Regarding taste and texture, you will have to try it to pick your favorite one! And for those who believe that they have seen (and tasted) it all that Extremadura has to offer thanks to these seven selected landscapes, they are very wrong. Near Caceres you cannot forget to visit Las Hurdes, Campo Arañuelo, Sierra de Gata and the Valleys of Ambroz and Alagon. And in Badajoz, La Serena is just the starting point… You can follow your trip through Tierra de Barros, the mountains and Campiña del Sur, La Raya, and of course, Tentudia and Cornalvo . Enjoy the ride! In Extremadura, the landscape is linked to gastronomy. Hints of chestnuts, olives, tomatoes and sweet and tasty fruits. Do you want to savor Caceres?